In this year’s City of Moose Jaw budget, the tone is one of asking for more cash, only with one major exception: the Downtown Facility and Field House (DFFH). The board that is responsible for Mosaic Place and the Yara Fieldhouse wants to move away from the business of concert promotion. The DFFH, commonly known as the Multiplex, will be seeking $691,370 in an operating subsidy in 2018 versus the $746,415 they received in 2017; or a requested decreased from general tax revenues of $55,045 that represents just over a seven per cent decrease year over year. “We were within budget last year. We are asking for less than last year. We are making progress on it, we are working to reduce the subsidy,” DFFH interim board chair/Councilor Brian Swanson said in an interview with MJ Independent. "Finances are a lot better than what they were,” Swanson said. Highlights of the DFFH budget include a decrease of total expenses from $3,835,549 in 2017 to $3,432,715 in 2018 or reduced expenditures of $402,834 year over year. While at the same time total revenues have decreased from $3,089,134 in 2017 to $2,741,345 in 2018 or a decrease of $347,789 year over year. 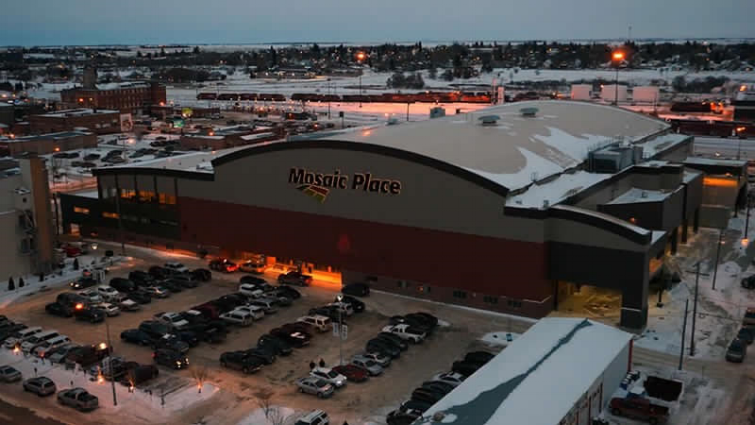 The budget signals a major change in policy for Mosaic Place. The budgeted revenue is down for bowl events, such as concerts, from $651,700 in 2017 to $293,938 in 2018 or a drop of $357,762. A drop of almost 55 per cent. Accompanying the bowl revenue will be a drop in food and beverage revenue. Food and beverage revenue will drop from $236,209 in 2017 to $148,000 or a drop of $88,209. A drop of approximately 37%. While at the same time, bowl expenses – largely the cost of promoting concerts - have dropped from $460,000 to $65,448 or a drop of $396,552. It represents a drop of 86%. If you subtract the bowl revenue losses of $357,762 from the bowl expenses reduction of $396,552 the resulting figure is $38,790. The requested operating subsidy in 2018 is $55,045 or a difference of $16,255. Asked if these figures indicated concerts, or at least some concerts, had been losing money, Councilor Swanson would not reveal any details, citing confidentiality agreements with performers. At least one concert has lost money in the past. It is well known that the Megadeth concert in March 2016 lost somewhere between $60,00 to $80,000, largely due to poor attendance. Councilor Swanson claimed the entire Western Canadian concert scene was struggling; with less acts performing. “The booming oil economy is not there anymore", he added. On the positive side, contracted revenue is up at Mosaic Place, from $557,171 in 2017 to $656,796 in 2018. Contracted revenue is derived from such groups as the Moose Jaw Warriors and recreational hockey clubs. Asked if any of the changes will negatively effect the Moose Jaw Warriors, Swanson said it was the exact opposite of that; with the DFFH now being more accommodating to the team. “We made some improvements for the Warriors, such as helping them get better dates for games…when they set their schedule we are going to be as accommodating as possible…helping them get more lucrative weekend games,” he said. The Warriors recently signed a five year contract, with options for two extensions of one year each. Under terms of that agreement, the Warriors pay a base rate or 10% of the gate receipts; whichever is the greatest. For playoff games, the Warriors pay more. “When they (the Warriors) do well, we do well,” he said. Another major positive are other revenues at the Moose Jaw Ford Curling Centre; $82,463. This revenue source had never before appeared in the budget. Other revenues come from summer rentals. Plus food and beverage sales are budgeted to increase nine fold at the Curling Centre from $3000 in 2017 to $27,000 in 2018. The reason is "more accurate budget reporting", Swanson said. Revenues at Yara Centre are projected to be stable with 2018 budgeting $582,415 compared to $581,570 in $2017. An increase of $845. Budgeted expenses were $743,203 in 2017 to $784,354 in 2018 or an increase in expenses of $41,151. On the capital side, the DFFH board requested $25,000 for Yara Centre front desk relocation, a Mosaic Place elevator lockout system worth $10,000, a Mosaic Place north stairwell access expansion worth $10,000 and Mosaic Place barricades worth $40,000. Funds will come from the DFFH capital upgrades account. Councilor Swanson pointed to the past, when DFFH had requested close to $1 million annually, in subsidies, and that great strides had been made, with more to come. With the release of the Meyers, Norris & Penny Report (MNP) in September 2016, the entire DFFH board was dismissed and replaced with an interim board. The MNP report was commissioned by Council to investigate the operations of the DFFH, after then Councilor and DFFH board member, Candice Kirkpatrick resigned, citing that she could not support the DFFH's forthcoming budget. The MNP Report was critical of the then DFFH board, who were too reliant and trusting of former CEO Scott Clark. The MNP Report found Clark intentionally controlled data and withheld vital information, making it difficult to make board decisions. Plus Clark lacked a proper understanding of the budget development process with the DFFH board and Council. Clark participated in the MNP review but found other similar employment in Grande Prairie, Alberta, shortly before it's release. Clark has refused all media enquiries for comment regarding the MNP report. The DFFH will present their budget at Monday night’s budget meeting. The Six Million Dollar Water Main. Moose Jaw Budget: "Status Quo"